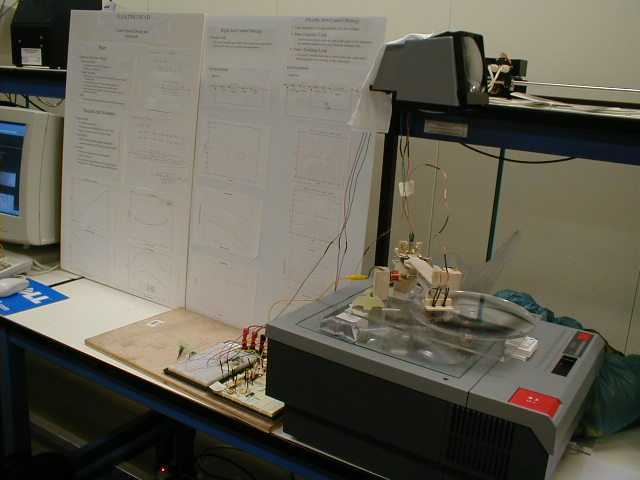 The goal of this project was to design and build a system composed of sensors, an actuator, and a physical plant, all constructed out of primitive parts. 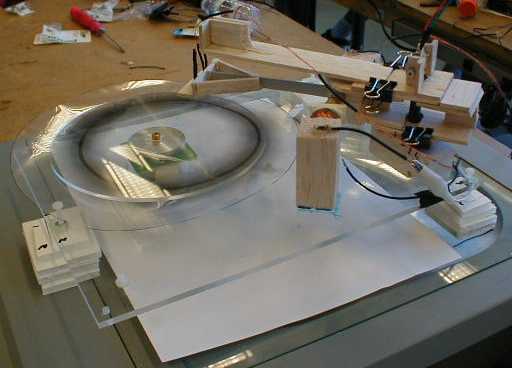 We built a model of a hard drive out of balsa wood that tracked a line on a spinning disk. We placed two phototransistors at the end of the arm in a differential hookup that measure the difference in infrared radiation shinning up through the bottom of the disk. At the base of the arm we have a push-pull magnetic induction coil actuator that moves the arm along an arc as you supply current through the coils. 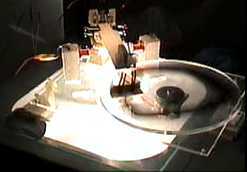 In the first stage of the project, we used a stiff arm so that the system was second order and much easier to control. We hooked up a simple lead controller from the phototransistors to the actuator and tweaked the gain until the arm accurately tracked the blurry line on the spinning disk. As an extra challenge, we made the arm flexible to move to a fourth order system which is more difficult to control. To make the controller simpler, we added a magnetic flux sensor that measures the base angle and built the controller using successive loop closures. Again, we tweaked on the gains until the arm accurately tracked the blurry line.